A concentrated super cleaner & degreaser for multiple uses. 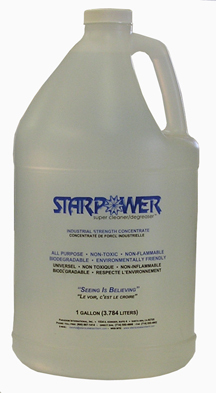 StarPower Super Cleaner/Degreaser is a versatile multiple use concentrate. Excellent for removing deposits of rust oxidation, scale and sooty matter and can actually reduce the recurrence of oxidation. StarPower has great rust and corrosion inhibiting properties. Free of surfactants and emulsifiers making it safe for use with oil/water separator.